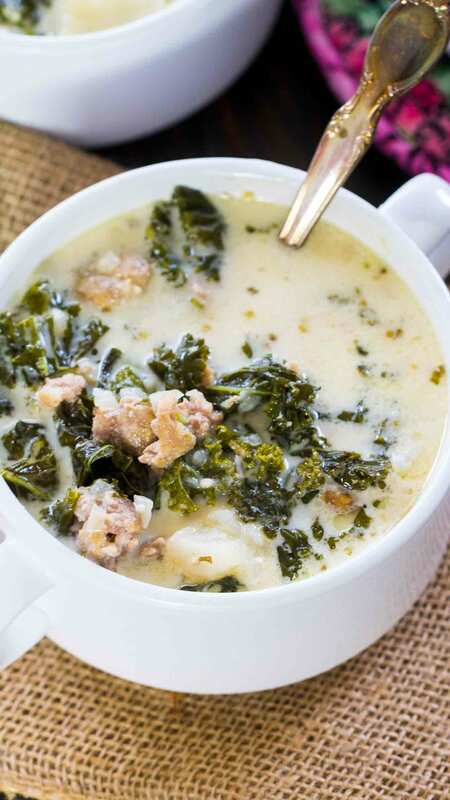 Instant Pot Zuppa Toscana is the Olive Garden Copycat easily made in the pressure cooker in just 40 minutes with budget-friendly ingredients. Instant Pot recipes are a staple around here. We love making delicious and easy soups in the Instant Pot like our popular Tomato Soup, Ham and Bean Soup, and Italian Meatball Soup. Instant Pot Zuppa Toscana is rich and hearty comfort food at its best. The delicious Olive Garden Copycat that usually takes hours to make in the slow cooker, is ready at a fraction of time. This pressure cooker version will take you 40 minutes only with the same delicious and comforting results. 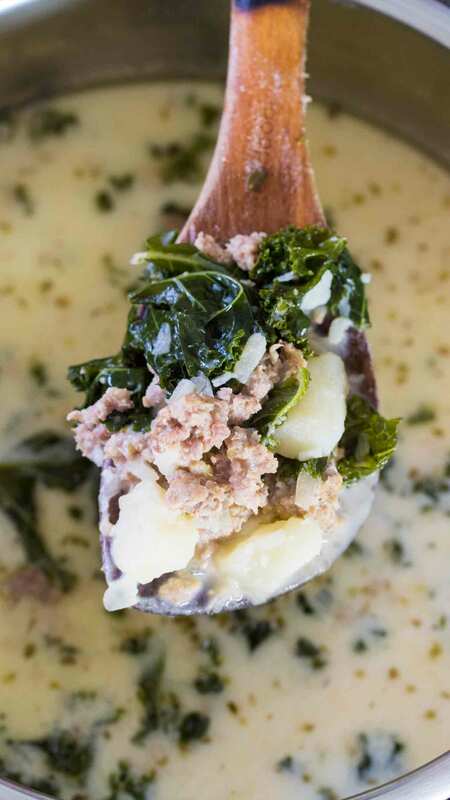 This is such a hearty and creamy soup, made with ground sausage, potatoes, and kale. Instant Pot Zuppa Toscana is very budget friendly, you can make a big pot spending $15 or less. 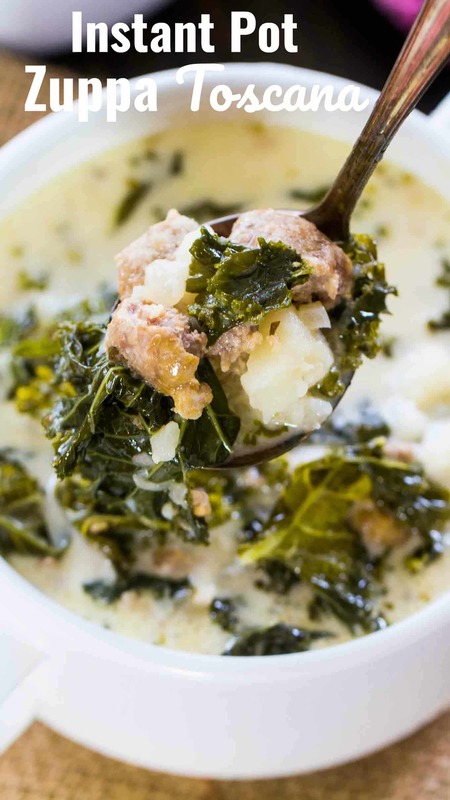 I love the sausage in the creamy broth with all the delicious soft potatoes and the chewy kale! The soup will taste absolutely amazing if you saute some chopped bacon with the sausage! If you want to enhance the flavor, that is a great addition. After you add the kale, you can cook it on sauté with the lid on for 2 minutes to make it more tender. Or, just stir it in, and cover with the lid to heat through for 3 minutes, if you prefer the kale chewier. Also, you can use mild sausage or a combination of mild and hot. I like to add oregano for the flavor, you can skip it if you don’t like it. Deglazing the pot with broth after you brown the sausage and the onion is very important. Some sausages may stick to the bottom and may interfere with the IP coming to pressure, so don’t skip the degrading step. 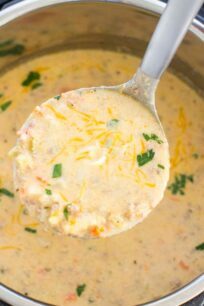 If you want the soup, even creamier, when the potatoes are cooked, before you add the kale, you can use a potato masher to mash the potatoes, even more, that will change the consistency of the soup. Also, you can use light cream or half and half instead of full-fat heavy whipping cream. You should taste and adjust for salt, pepper, and spiciness. Absolutely. Italian sausage can be substituted with ground chicken, turkey or beef sausage. If using beef sausage or ground beef, replace the chicken bouillon and chicken broth with beef bouillon and beef broth, the same quantities apply. Please note that the soup will thicken even more when cold. Can I use spinach instead of kale to make Zuppa Toscana? You can use spinach instead of kale. In that case, you just have to stir in the spinach into the hot soup. No need to cook on sauté, as the spinach will wilt quickly. Yes. I recommend using quart bags for this soup. First, use a cup to transfer the soup from the pot into the bag. Then, squeeze out excess air and seal the bags. The bags can nicely be stored in the freezer for up to 2-3 months. Also, when reheating, you may need to add a bit of milk, add a ¼ cup at a time. Preferably heat it on the stove top if you will be adding more milk. A Natural Pressure Release means that the pressure is released gradually. For a Natural Pressure Release, you click on Keep Warm, and wait 10 minutes, after which you open the valve and let any leftover pressure to release. Another option is to Turn Off/Unplug the pressure cooker, wait 10 minutes and after that open the valve. A natural release is usually used when cooking soups, meat in a large amount of sauce, pasta or steel cut oats. This method prevents any foam from the dish to shoot out through the valve, which can happen during a Quick Pressure Release. 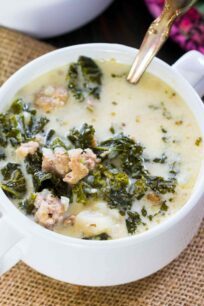 Easy Instant Pot Zuppa Toscana is the Olive Garden Copycat easily made in the Instant Pot in just 40 minutes with budget friendly ingredients. Turn the Instant Pot to Sauté mode, and when it reads Hot, add the olive oil. Add the sausage and brown it for about 5-6 minutes, stirring occasionally, until you get a nice golden brown color on the outside. Add the diced onion, minced garlic and oregano, stir to combine. Cook for 2-3 minutes. Add two cups of chicken broth to deglaze the pot, stir well and make sure to scrape the bottom of the pot, to get any sausage pieces that stuck to it. Add the diced potatoes and pour in the remaining 4 cups of broth, stir to combine. Cancel Sauté mode, close the lid, set the steam release knob to Sealing and set to Manual (or Pressure Cook), and choose 5 minutes High Pressure or select Soup mode, click on adjust and select High (for High Pressure) and adjust the time to 5 minutes. It may can take several minutes for the IP to come to pressure as it contains a lot of liquid. After cooking cycle ends, allow a 10 minute Natural Pressure Release, after that manually release the rest of the steam. Once all the steam has been released, open the lid, and add in the kale, stir well. Cover and let heat through for 2-3 minutes to soften the kale. If you want the kale more cooked, select Sauté before covering the pot for 2 minutes. Stir in the heavy cream, taste and adjust for salt and pepper. This looks delicious! Saving this! I got a new Instant Pot for Christmas and can’t wait to try this one! This looks just perfect for this week. I need a little post-holiday comfort food! This soup looks 1000x better than Olive Garden! Looks so creamy and amazing. 🙂 Definitely adding this one to the dinner lineup! This is SUPER DELICIOUS! My hubby loved it and so did I. I used spinach, and added some mushrooms. So good. Thanks for sharing! Hi Valerie! Thank you for the feedback, glad that your family loved it! Saving this recipe! I love soup but I have never tried this zuppa toscana recipe before. We love our instant pot because it makes preparing dinner so much easier. Going to add this one to the list. 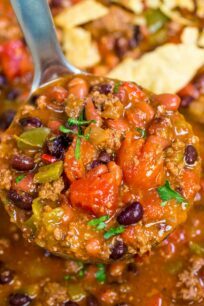 I am scouring the internet looking for instant pot recipes. 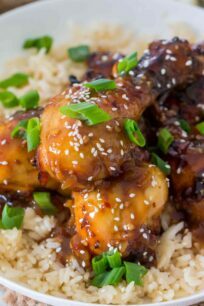 I am new to this adventure and need recipes to make for my family. I have never eaten Zuppa Toscana, so this will be a tasting adventure, as well. To be honest, I have never been to the Olive Garden, thus I’ve never had their soup. I have to say, though, this looks absolutely amazing and with a combination of flavors that I love. Will definitely be giving it a try. This looks delicious! If I decide to add soaked kidney beans to this, do you suggest I pressure cook it to maybe 20 minutes or so? Depends of the beans actually, if using pre-soaked great-norther or cannelini do 20mins, black eyed peas about 15mins. This turned out super delicious! Everyone loved it! My husband ate about 3 bowls. Also, I brought it to a friend and she LOVED it but she doesn’t have an instant pot. Do you think she could make it on the stove? Thank you! wow so happy that it was a hit with your family! I made this tonight. So good! I cant wait to make it again! Hi Jen, happy that you liked it. Thank you for the feedback! I thought the soup turned out too thin. I added instant potato flakes to the finished soup. I also added soy sour cream and lactate free milk as I’m lactose intolerant. I also added crushed red paper flakes and extra ground fresh pepper and some butter. Turned out much better.